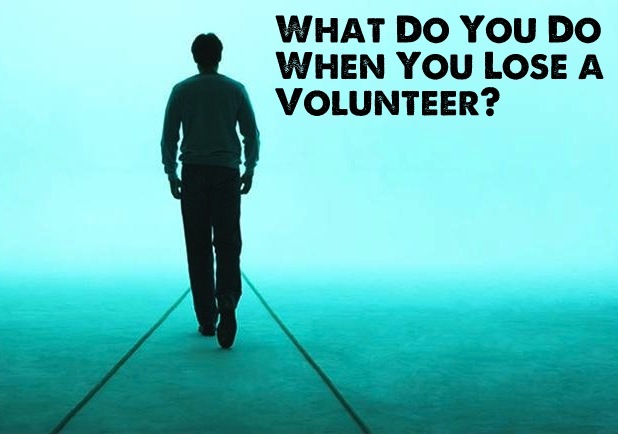 What Do You Do When You Lose a Volunteer? Volunteers are important for local church ministry. Without volunteers ministry would not happen within a church. Sure we have paid staff members, but they can’t do everything. A good ministry within the local church is only as good as the volunteer team that makes it happen. When it comes to effective student ministry volunteers are key. So what do we do when we loose a volunteer? What do we do when a volunteer decides to step down and it leaves a hole in our ministry? A hole that needs replaced. Here are a few thoughts on what to do when you loose a volunteer in your ministry. I’m writing to student pastors as I normally do here on my blog, but the thoughts and ideas are applicable to anyone in local church ministry that leads a team of volunteers. Encourage the volunteer. When a volunteer steps out of your ministry, don’t get mad at them. Don’t make them feel guilty and let things become awkward between you and them. Encourage them and thank them for what they have been doing in your ministry. Share with them the impact they made on the students they worked with. Most of the time, although not all the time, a volunteer will step out of your ministry for a good reason. It may be they are burned out and need a break. They may have important things going on within their family that needs their full attention. They may be simply over committed. Make sure you encourage them and don’t burn any bridges. You never know when God will bring them back to your ministry. Don’t rush to feel their spot, be patient. When you loose a volunteer the first thing your going to want to do is fill their spot. This isn’t a bad thing because their spot needs to be filled, especially if they were in an important role working directly with students. But be patient. The worst thing you can do is throw someone in their spot that if not gifted for it or doesn’t have a passion for that area. Pray and let God direct you in filling their spot with the right person. Inform the other volunteers. Don’t make a huge deal about it, but inform the other volunteers in your ministry. You don’t want nasty rumors of assumptions to start so share with your volunteers that “so and so” step out of their volunteer role and make sure to respect the person and the reasons for them stepping out of your ministry. If they left for the right reasons this should not be a big deal, but in case they left for a confidential reason, keep that between you and them. Just share with the other volunteers “so and so” is not a volunteer anymore. Share with the students directly involved with that volunteer. No need to make an upfront annoucnemnt to all the students. Simply share with the students who were directly involved with that volunteer. For example, if that volunteer was a small group leader, share with their small group that their leader has stepped out of his position and make sure they understand the situation (if that is appropriate). Loosing a volunteer is tough. I recently just lost a great volunteer in our student ministry. It’s going to happen and it’s not the end of the world. Make sure to handle it with care and know God is in control of the situation. Great post. In the past I have not handled it well when a volunteer leaves our ministry unexpectedly. Great advice! Thanks for stopping by and checking out this post. I am still pretty new to youth ministry so learning this stuff myself. I would also encourage, if possible, to have a process time with the volunteer almost like an “exit interview.” sometimes it is heated and this is not possible but you want to continually follow-up to learn what you did wrong/what went wrong or just maybe assess where they are at. Good post. Good thoughts. I like the idea of some type of “exit interview” with the volunteer leaving. As you said, this will help us do better in our ministry as well as see where that person is at.